Kershaw Emerson Knife 6031 CQC-11K. 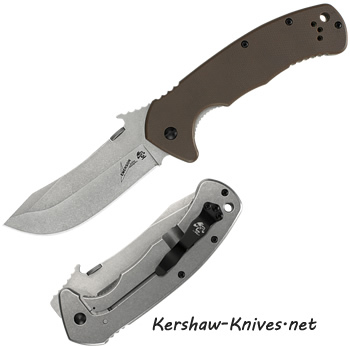 Kershaw and Emerson have teamed up again to get this great survival and hunting knife. Nice large oversized handle and blade- just perfect for getting your game cleaned. The brown handle has a nice large finger hold groove and G-10 scales on the front to help secure your grip. The back side is smooth and made with bead blasted 410 steel, has a lanyard hole. Pocket clip can be changed from left to right carry in the tip up position. Opens manual style and with the wave disk opener- slide on your pants pocket and this blade will deploy. Frame lock system. Blade is 3.5 inches long, stone wash finish, and made with 8Cr14MoV steel. This knife is ready for your next hunt!